Entfliehen, um private polynesischen Villa auf Motu Ahuna und genießen Sie die luxuriösen, isoliert Heiligtum Ihrer exotischen Tarif auf Bora Bora, der als einer der exklusivsten und schönsten Insel Destinationen der Welt. Von der Hauptinsel getrennt, war Motu Ahuna die traditionelle Rückzug der hohen Chefs Bora Bora, und wo Puni, ein wilder Krieger-Chef, tauschten Geschenke mit Kapitän James Cook, der ersten europäischen Besucher. Die außergewöhnliche Lage der Insel, mit seiner unglaublichen Aussicht auf mythische Berg Otemanu über die türkisfarbene Lagune, nie seinen Reiz verloren und diente als natürliche Dekor in mehreren klassischen Südsee Filmen wie "Tabu" oder "Meuterei auf der Bounty" mit Marlon Brando. Alte Bora Bora lizenz sicherlich wusste, wie man sich entspannen und jetzt können auch Sie die allgegenwärtigen beruhigenden Kräfte dieses verzauberte Insel zu erleben. Ihr Morgen wird unweigerlich mit einem herrlichen Sonnenaufgang Entfaltung direkt vor dem Start. Um Ihren Tag zu füllen können Sie den frühen Morgen Strand, an dem die einzigen Spuren werden eigene Faust zu gehen. Gehen Sie schwimmen oder Schnorcheln in der Lagune, Ihre natürlichen Wellness, die aufgrund der Nähe der einzige Durchgang zum offenen Pazifik ist mit belebenden Meeresmineralien belastet. Entdecken Sie das Riff, oder paddeln Sie Ihren Auslegerkanu an den Korallen und eine Vielzahl von bunten Fischen bestaunen. Oder gönnen Sie den ultimativen farniente, und nur in der Hängematte träumen, um den Klang von raschelnden Palmblätter in einer Brise. Ein kleines Motorboot, dass Sie sich zu steuern, steht Ihnen zur Verfügung, um die Lagune zu erkunden oder zu kaufen Lieferungen in Vaitape, dem Hauptort von Bora Bora, ca. 10 Minuten entfernt. Privat und diskret, bietet die Villa Ahuna zwei Fahrpreis (Strohdach-Bungalows) und ein großes Fahrpreis pote (Strohdach Open-Air-Lounge mit Bar und Küche) auf vier Hektar großen gepflegten Strand Grundstück. Es hat seine eigene regen Wasserversorgung und Solarstrom. Ideal für zwei Paare oder eine Familie, die nach einem einsamen Wochenende am schönen Bora Bora suchen. Villa Ahuna, paradis sur l'eau! difficile de trouver les mots pour décrire cet endroit tellement il est magique! lLa villa constuite dans le style traditionnel est magnifique! Et le cadre est incroyable! vous vous levez, vous marchez cinq mètres dans le sable et vous vous baignez dans les eaux turquoises du lagon! dépaysement assuré! et le petit bateau mis à notre disposition nous a permis de nous rendre sur l'ile de Bora à notre guise.Mais le Motu ne serait pas le même sans Tatiana et Joel ! Ils en sont un peu les gardiens et l'âme...toujours présents mais avec beaucoup de discrétion ils sont toujours prêts à répondre à toute question ou demande. Ils ont largement contribué à rendre ce séjour inoubliable!nous n'avons qu'une envie : y retourner! Fantastic get away from the tourist scene. The place was beautiful and relaxing. This is not your typical island retreat. You will have to rough it a little. No air, room service or walking to the store but that's the whole point of this place. To fall off the edge of the earth into your own paradise. Property was well taken care of and clean for being an open house, no doors or windows in the main house. Sleeping quarters were covered and lockable. Caretakers were attentive and left us to our own unless we needed something. Brought us fresh fruit a couple of times. Little bit of a language issue but hand signs work well enough. Lots of tours for seeing the island and the surrounding water. We were provided with a 15 foot boat to do our own site seeing and getting back and forth to the main island for food, etc. If it rains, you get wet. If the waves are a little rough, you get wet. This is all part of the adventure. There were 4 of us and we had plenty of room to hang out. The views from the house and property are beautiful. Bugs were not an issue due to the constant breeze over the island. Bora Bora is a wonderful place to take on this adventure. Iaorana. We stayed at Motu Ahuna Villa in mid May and had chosen that time frame to be sort of in between the summer and winter seasons. It was a good choice with highs in the upper 80's and lows in the upper 70's every day. We had some rain, but not much, and there was a nice breeze much of the time. There were 4 of us (2 couples) and we had the most wonderful vacation. It truly was the trip of a lifetime. As others have said, you need a bit of an adventurous spirit or this is not the place for you. It helps to have at least one person with some boating experience. Cooking our own meals, including those over the fire pit (barbeque), was all part of the experience that we will forever cherish about this trip. I really enjoyed my cold 22 oz. Hinanos sitting on the picnic table by an evening campfire, watching the stars (there have to be more stars in Bora Bora! ), and the boats coming and going through the pass in front of the Motu. Bora. Your store (The Farm) is incredible! I hope we are able to return some day. Thanks again (Mauru' uru) and if you ever need a good reference for your villa, I would be more than happy to provide one. The other reviews said it all. I am fortunate to have been to Bora Bora many times .I have stayed at very fine hotels but this experience is special.It is as you would hope a getaway to some exotic ,private, non touristic , primitive island would be but with everything you need,if you are content with the kind of vacation where you relax and find the you that was lost all those years ago, this is it.One of the most beautiful spots on the most beautiful Island in the world. The most unique, fun place to stay ever! The trip of a lifetime!!! 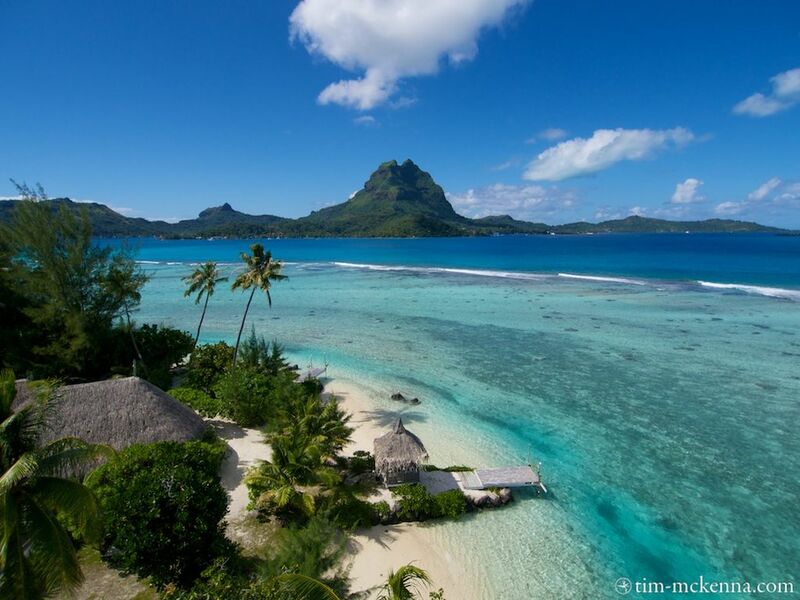 We have always dreamed of a trip to Bora Bora, and envisioned ourselves staying in an over the water bungalow. But after doing extensive research, we decided that we wanted an experience more authentic and private. The over water bungalows look great in pictures, but in reality they are right next to each other and you have very little privacy. We found Villa Ahuna and I knew instantly that this was where we wanted to stay for our dream trip. I booked the property for 9 nights. We were a bit nervous since we had never been to Bora Bora, and we weren't sure of logistics, the location, etc. We are both boaters and sailors, so the thought of having a small boat as our primary transportation for vacation was very exciting to us. All of our communications with Tea, the owner, were gracious, and any questions we had prior to our arrival were answered promptly. We were greeted at the airport on arrival by A young woman named Bellen, and a boat driver named Tuma. Bellen was a pleasure to meet, and she gave us our initial introduction to Bora Bora, and a quick tour of the area by boat, pointing out restaurants, markets, places to dock our boat, etc. We arrived at the Villa, and Bellen gave us an extensive briefing on the property. Pictures don't really do this property justice - it is huge, and there are several gazebos, docks, beaches, tables, eating areas spread around it. The main living area is very large as well. There is a huge kitchen/bar area with seating around the kitchen. There is a stove, refrigerator, sink and a full supply of cooking utensils. The living room area is also very large, with 2 couches and 2 loveseats/chairs. There is beautiful artwork all around, shells, carvings, and other island art. The property came with it's own cat, Mitzi, that was the sweetest, friendliest cat I have ever encountered. The sleeping accommodations are in 2 bungalows that I think came from the Old Bora Bora Hotel that was destroyed in a storm. Each has a lovely king size bed and bathroom. Although there is no air conditioning, there are fans provided, and we had no problems sleeping. One of the most memorable things is waking up at sunrise and hearing the waves breaking on the reef just outside the door. We fed the fish from the dock, and there was a small octopus that lived by the dock that ate every morning. The small boat provided was adequate for trips to Vaitape for shopping as well as circling the island. If you crave adventure this is the place for you! We stayed in august 2011 one week in villa ahuna with our 2 children. We found a beautiful villa with all equipments you need ( washing machine, freezer, a little motorboat for 4 people, refrigerator ) to have a comfortable stay. The 2 bedrooms are seperate bungalows and formerly belonged to the hotel bora bora and are very charming. Everything was safe on the island, you can lock the bedrooms, refrigerator and you have 2 safes . But the villa is built very stylish with a lot of good taste. You can compare it to north island on the seychelles.The sun is getting up behind the hills of BB and goes down to the ocean. These are the moments i will always remember. The contact to the owner Tea Suchard and her family was very very warm. She took us from the airport, explained evertyhing on the island, invited us to her home, where we spend a wonderful afternoon, with her daugther Kohei, her father Erwin Christian and his wife Ahe. After ahuna we stayed on the beautiful rohotu fare lodge and the luxurious four seasons and Tea took us to both hotels with her own boat complimentary. Tea said we were the 2. guests on motu ahuna, she opened in 2010. A american couple stayed 4 weeks. Motu Ahuna is a very special place on BB, you will find nothing comparable. So if you dreaming of an extraordinary experience, don`t hesitate, go to villa ahuna and be happy, but keep an eye on the villa so we want to come again.